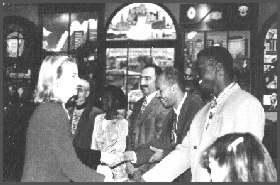 In my opinion, one of the finest examples of the coming together of many nations and cultures was an event that occurred on Monday February 17, 1997 at the Kitchener City Hall Rotunda, celebrating 50 years of Canadian Citizenship with the passing of the Canadian Citizenship Act in 1947. During the week of February 10-17, citizenship courts were held in both public and separate schools, as we welcomed new Canadians with citizenship. In each court twenty new citizens were welcomed as Canadians and joined in the bond of commitment and loyalty which unites all Canadians. His Honour, Judge Robert Sommerville directed some of his remarks to the audience, both old and new citizens. When he asked for those persons who were not born in Canada to raise their hands, very few people, other than the brand new Canadians, were able to do so. About one-half of the audience raised their hands when asked if any of their parents were not born in Canada. When he then asked if any of the audiences’ grandparents were not born in Canada, the majority of hands were raised across the audience. This was a very touching and visible reminder of how very close we all are to being immigrants here and also reminded all of us how very thankful we are that our parents or grandparents chose Canada to be their homeland. Judge Sommerville charged the new citizens with the responsibility to be protectors and promoters of these four characteristics of Canada, which were so important to them and to ensure that their children and grandchildren, as well as new immigrants, continue to find these things to still be true in the years to come. Those of us who perhaps have taken these four things for granted were moved to reaffirm our committment to uphold them alongside our fellow ‘new’ Canadians. I wonder how many Canadian-born truly feel the significance of being handed a ‘document’ that, in reality, marks the beginning of your second chance at life !